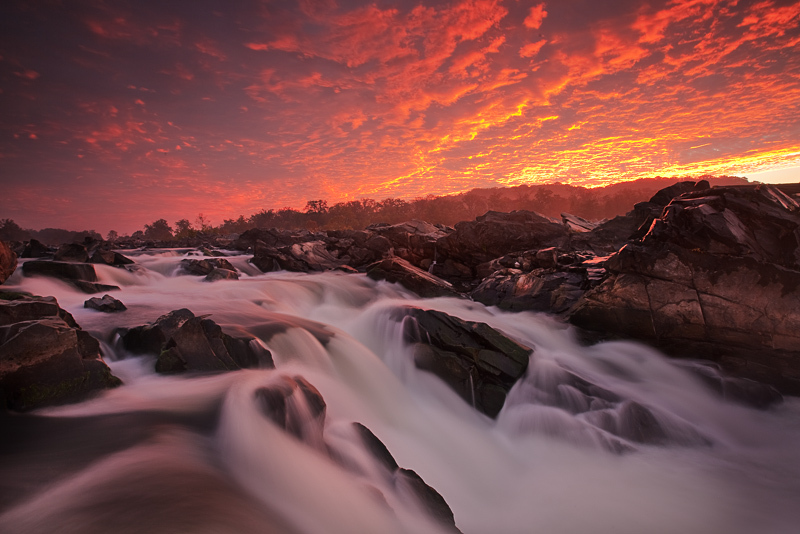 A fantastic display of light over the Mather Gorge area of the Potomac River during a late autumn sunrise in Great Falls Park, Virginia. This was probably one of the 3 best sunrises I have ever witnessed. During this image, the river was actually running lower than normal allowing me to get further out on the rocks. I had pre-scouted the location the night before. The clouds seem to appear out of nowhere as it looked to be a relatively clear morning and I certainly wasn't expecting this kind of result. The river forms the natural border between the states of Maryland and Virginia and is popular with hikers, kayakers, and rock climbers. Photo © copyright by Michael Greene. All material © copyright by Michael Greene. All rights reserved. Site by WideRange Galleries.